We came upon David Best, Larry Harvey’s brother Stewart and his son Brian out beyond the Temple, and they had just finished setting up a playa memorial for their departed friend, brother and uncle. The moment, like the mini-Temple itself, was a family thing. There was laughter and sadness and remembrances, but mostly laughter. The sun was getting low in the sky, and it was clearly cocktail hour, and sure enough, here came Jack with a tray of gin and tonics. Why yes, thank you please. We hadn’t seen either of them since July at San Francisco’s Castro Theater, where a spoken word event was held in memory of Larry. David, who built the first and many of the succeeding Temples in Black Rock City said this was not his creation “It’s everyone’s work; I didn’t want to do a Temple, I couldn’t,” he said firmly. There are four photos of Larry, one on each side, and one black and white photo features him looking all James Dean-y posing on a motorcycle. “He tried to be a badass, but it never really worked,” Stewart said. There are also willow branches tied to one of the upper quadrants, an homage to the willow tree that Larry and Stewart grew up playing under in their childhood home. You can see more of Stewart’s childhood and family photos HERE. “This was all a big tree and we just whittled it down to this,” Stewart joked. That wasn’t true, of course. The wood came from various sources, including scrap pieces that Brian had scooped up at the Man base. “The Saturday night thing,” Best said of the Castro Theater event, “except for Tristan, who finally said, ‘My dad’s dead,’ … it was a thing where everybody was trying to keep Larry alive. … That night, we didn’t come away cheered up. “When we got to the house the next day, we were just all laughing. … That was our family. That was our wake. … We all had the vision to make something. We don’t want to be morose, or wallow in sorrow. But it does rise up out the dust sometimes, and you find yourself wiping your eyes, even if the wind isn’t blowing. The other night, we ran into Carmel at the Larry spot, which, especially at night, feels like you are sitting in a graveyard. There wasn’t another soul around. Carmel is one of the most ebullient people you could ever hope to meet, but the moment, the setting and the silence had sent her into a reverie. “I knew this was going to be here,” she said, “but I kind of forgot about it.” There were tears in her eyes. 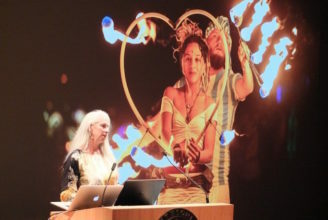 Her mom, Syn, and her dad, Lightning, have been crucial parts of the Burning Man community for many years, as artists, as volunteers, and as guiding spirits. She’s literally grown up in and around Burning Man. The thing is, some of the most central and deeply committed people here have lost a very dear close friend. There’s no forgetting or escaping that simple fact. The haze of smoke that has lingered over the playa for these many weeks has softened the light, made things shine a little less brightly, which seems fitting. We can’t describe the mood at first camp, but we know that Larry’s trailer is there, as always, even if he is gone. People will see it every day, and you can’t help but commiserate with those who have to see the daily reminder. There’s a sticker going around that absurdly but probably insensitively marks Larry’s passing. It has caused a bit of a stir. The sticker has Larry wearing sunglasses, and he is being propped up by two friends. It’s a takeoff of the movie poster for “Weekend at Bernie’s,” in which the character Bernie is made to seem alive, when he is in fact dead. It’s all for the benefit of being able to keep the party going. The sticker’s tagline says, “Larry would have thought it was funny,” and that’s probably true. The wind is blowing steady and strong, and the weather service has put out a warning for dusty conditions for the next couple of days. We like to think that the constant blowing dust that has been battering us all day is just the welcome mat for all the people who are making their way to the party. Cars coming in Gate Road generate a lot of the dust that then blows across the city, so it’s really our own damn fault. It’s going to be hot in the daytime, and cold at night, and super dusty. That’s our prediction, and we’re sticking to it. Collexidus starts on Saturday, the day the Man burns, and the day many people try to beat the crowd and slip out of Black Rock City early. There will be volunteers there to collect the stuff you didn’t use, and maybe don’t want to transport back home. To be clear: We need your stuff. We eat it and drink it for weeks after the event during Playa Restoration, and it is stored in the offseason for when we come back in July to start getting ready again. So be generous to the people there taking donations. Help us help you. There’s a neighborhood of micro bars that you can visit on 7 o’clock road, starting around B and extending outward. (Side note: It is often difficult to tell people where something is and when it will take place, because addresses are marked by the clock. “See you at 7 o’clock!” Uh, is the time, or the location?) Anyway, visit the neighborhood bars at your leisure. Allow plenty of time, and bring a cup. The work crews got together Friday afternoon to celebrate the end of the work season and acknowledge that yes, Burning Man is actually upon us. Crews come streaming from all over the playa – the crews from Spires, HEaT, Roadworks, Power, Shade, all of them come to party at 4:20 pm at 4:20 on the city grid. An insanely janky Last Spire is erected on the spot, and surrounded by the Octagon that is used during survey. Hey, it’s art, and it needs protecting! Anyway, there is much partying and jackassery as the Spire is adorned with all manner of flotsam and jetsam. Go by and take a look for yourself at what a couple of hundred exhausted people think is funny. After the big celebration, there was a sledgehammer-throwing competition. Bonus was the winner, and Booya was the runner-up. Booya was not completely unhappy, as he avoided having the “award” of having one of the Fluffer ladies spit in his open mouth. It was just as gross as it sounds. There was also a plaque, which no doubt will garner much reverence. Bloom, one of the big beautiful art pieces here, is back after it’s debut in 2017. It is a giant jellyfish whose body is made out of orbs of recycled glass and old decanters that melted and molded into circles, then tied to the structure with bendable wire. Tweeter, aka Happy Medium, explained that Bloom 2.0 features an improved light show and a better way to climb around the structure. Much of the glass is from last year, but there are also a few new colors: the dark blue ones are made from repurposed Skyy Vodka bottles, and the shimmering green ones are recycled bottles of Jameson’s and Jagermeister. It clearly was hard work generating all those empty bottles, but somebody had to do it. So now the party is about to start. The gates officially open at midnight Saturday night, where the Gate crew will dress as clowns as they inspect the vehicles of the new arrivals. There may be fireworks, which are always welcome. Saturday morning was also the last morning meeting of the season. We shall not miss the alarm going off at 6:45 so we can drag our sorry asses down to the Depot to get the news and objectives of the day. “I’ve got one more thing to say,” he began, “and that is that I believe in Burning Man with my whole heart, and I am so very very grateful to all of you coming out here and helping me do what I love to do, and that is build this city for thousands and thousands of people, to give them a chance to break away from their world and see the world from a different perspective, to have a place to explore and get the validation and support that they may not get any other place in their lives. This is something really special, and I believe that truly and deeply. Ok then, the build is over, and we plan to go to Burning Man. We always SAY we’re not going to post anymore, but we always seem to anyway. We’ll see how it goes. But as the Commander said, we’re grateful and honored that you have made the journey with us, and we hope to see you out there in the dust and art and fire and community. Once again, super great work, John! Sorry I’m going to miss it. Have fun. See you on the flip flop. David (It’s not your fault) Best… No thanks. But it is very nice to see one person of color in all of the above photos. We’re making progress, folks! A life well lived and a legacy that will live far beyond him. Who can ask for more? new games being put into industry each week. Galaxy. The i – Phone game developers are smart since they make games that not only entertain kids but also help grooming them.